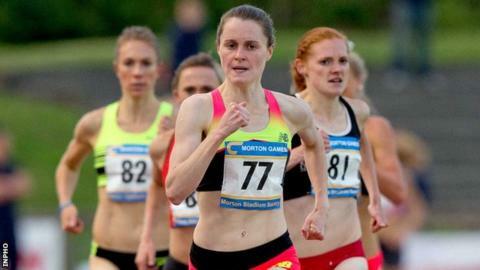 Portaferry runner Ciara Mageean continued her return to form by earning a superb mile victory at the Morton Games at Santry on Friday evening. Mageean, 23, tracked the pacemaker for the first two laps and then took the lead before holding off American Heather Wilson to win in 4:30.64. Wilson took second in 4:31.19 with another American Shelby Houlihan third. 2011 world champion Yohan Blake won the men's 100 metres in an Irish all-comers record of 10.12 seconds. Jamaican Blake, who benefited from Usain Bolt's disqualification to win the world 100m title in Daegu, finished ahead of compatriot Michael Frater with Ireland's Marcus Lawler equalling his personal best to take fourth in 10.47. Mageean ran her second fastest ever 1500m time of 4:08.32 in Belgium last weekend as she demonstrated that she has recovered from the heel injury which cut short her indoor season in March. The county Down woman, whose previous mile best was a 4:38.81 indoors clocking in 2011, missed all of the 2013 season and much of 2014 because of an ankle injury which first troubled her in 2012. She made a dramatic return to win the Irish 1500m title last year and her performances over the last week suggests that she could make a late bid to qualify for next month's World Championships in Beijing. The World Championship qualifying standard is 4:06.50 with the Rio Olympics mark 4:06.00. Mageean won a World Junior 1500m silver medal in 2010 and set her personal best of 4:07.45 for the metric mile distance a year later. Another county Down athlete Kerry O'Flaherty was among those behind Mageean as she took ninth in 4:40.95. O'Flaherty has already booked her place at the World Championships and next year's Olympic Games in her specialist steeplechase event. Donegal athlete Karl Griffin clinched a fine 800m win in 1:47.47 as he held off Americans Michael Rutt and Robby Andrews. Waterford woman Kelly Proper won the 200m in 20.54 but was .34 outside the World Championship standard while Brian Gregan took second in the men's 400m in 45.99 behind British winner Jarryd Dunn (45.89). Other impressive performances included Australian Sam McEntee's 3000m win in 7:48.35 and New Zealand's recent World University Games gold medallist Angela Petty's 800m victory in 1:59.09. As ever the Santry meeting ended with the famous Morton Mile and it was an exciting race as Australian Jeff Rieseley edged out American Pat Casey to win in 3:57.09. Dunleer runner Thomas Cotter become the latest Irishman to duck under the four-minute barrier as he set a personal best of 3:58.50 which left him as top home performer in eighth spot, with John Travers only 15th in 4:08.42.